Kendal May (holding banner) won the fifth overall market hog prize Wednesday at the market hog show. Pictured with Kendal are Fayette County Pork Queen Hannah Casto, Fayette County Fair Queen Bethany Reiterman, and the judge of the show, Nathan Day. Bethany Reiterman (center) won the fourth overall market hog prize Wednesday at the market hog show. Pictured with Bethany are Fayette County Pork Queen Hannah Casto and the judge of the show, Nathan Day. Brooklyn Baldwin (center) won the third overall market hog prize Wednesday at the market hog show. Pictured with Brooklyn are Fayette County Fair Queen Bethany Reiterman, Fayette County Pork Queen Hannah Casto, and the judge of the show, Nathan Day. Meri Grace Carson (center) won the reserve champion market hog prize Wednesday at the market hog show. Pictured with Meri Grace are Fayette County Fair Queen Bethany Reiterman, Fayette County Pork Queen Hannah Casto, and the judge of the show, Nathan Day. 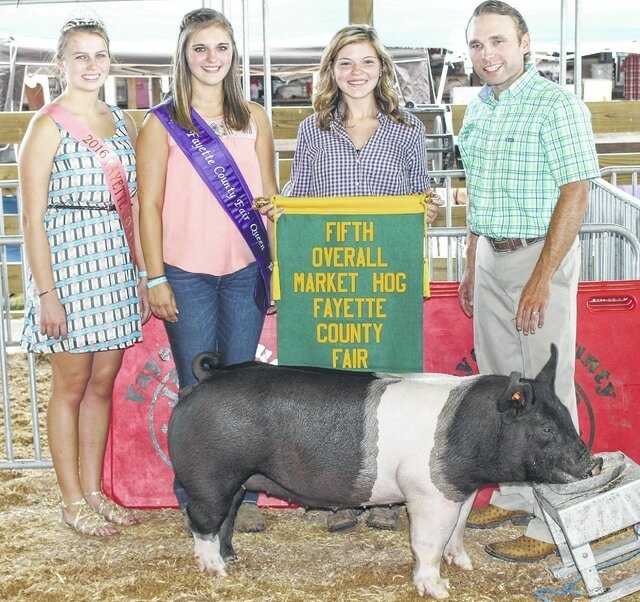 Aubrey McCoy (center) won the grand champion market hog prize Wednesday at the Fayette County Fair market hog show. Pictured with Aubrey are Fayette County Fair Queen Bethany Reiterman, Fayette County Pork Queen Hannah Casto, Aubrey’s sister Hillary, the judge of the show, Nathan Day, and Jim Garland. For Aubrey McCoy, it was a feeling like no other. 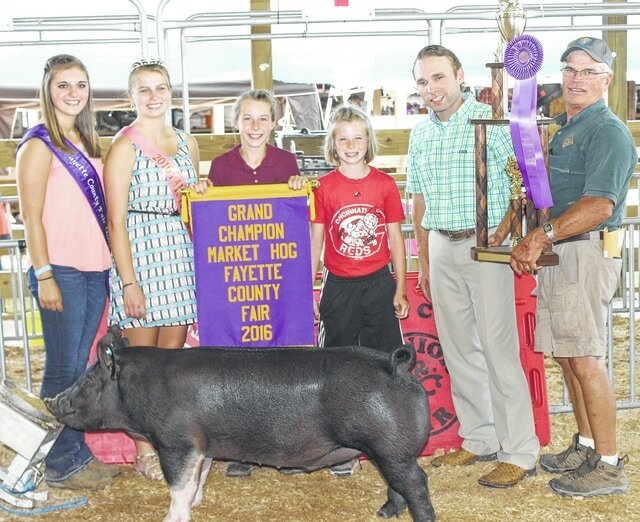 The 14-year-old won the grand champion market hog trophy at Wednesday’s Fayette County Junior Fair Market Hog Show. “When the judge came and slapped my hog to let me know I had won, it was the best feeling I’ve ever had,” said Aubrey, who will be a ninth grader at Miami Trace this fall. Earlier in the day, she also won the DC Barrow grand champion prize. Aubrey is the daughter of Bryan and Amanda McCoy, and is a member of the Top Performers 4-H club. Meri Grace Carson also excelled at the hog show, winning the reserve grand champion market hog trophy. Meri Grace, now 15, said she’s been practicing showing hogs since she was 4-years-old. “I was ecstatic,” she said when asked how she felt when the judge selected her as reserve champion. She is the daughter of Michael and Mary Ann Carson, and is a member of the Pigs-N-Things 4-H club. She also won the DC Barrow reserve champion trophy Wednesday. Brooklyn Baldwin finished third overall at the show, Bethany Reiterman finished fourth, and Kendal May (the overall hog showman) finished fifth. Kendal May won the Purebred grand champion prize, Brooklyn Baldwin won the LC Barrow grand champion, Bethany Reiterman won the DC Gilt grand champion, Kennedy Worley won the LC Gilt grand champion, Emily Reeves won the Purebred reserve champion, Jacob Hoppes won the LC Barrow reserve champion, Kendal May won the DC Gilt reserve champion, and Kylie Pettit won the LC Gilt reserve champion. 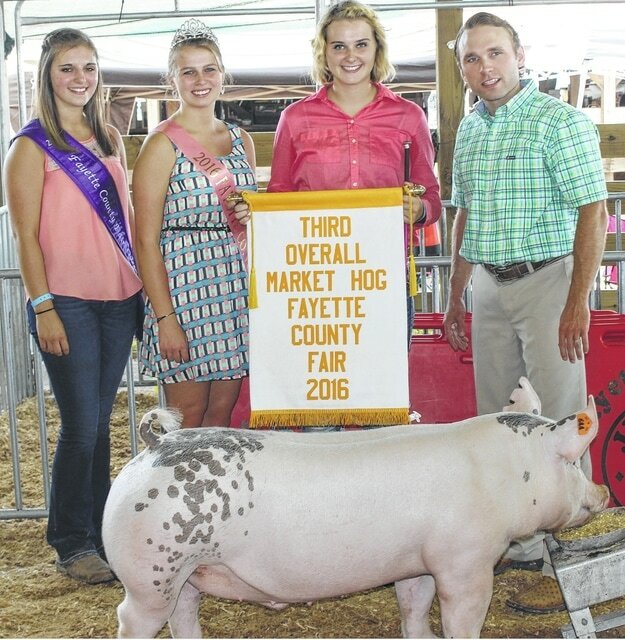 https://www.recordherald.com/wp-content/uploads/sites/27/2016/07/web1_FifthMarketHog.jpgKendal May (holding banner) won the fifth overall market hog prize Wednesday at the market hog show. Pictured with Kendal are Fayette County Pork Queen Hannah Casto, Fayette County Fair Queen Bethany Reiterman, and the judge of the show, Nathan Day. 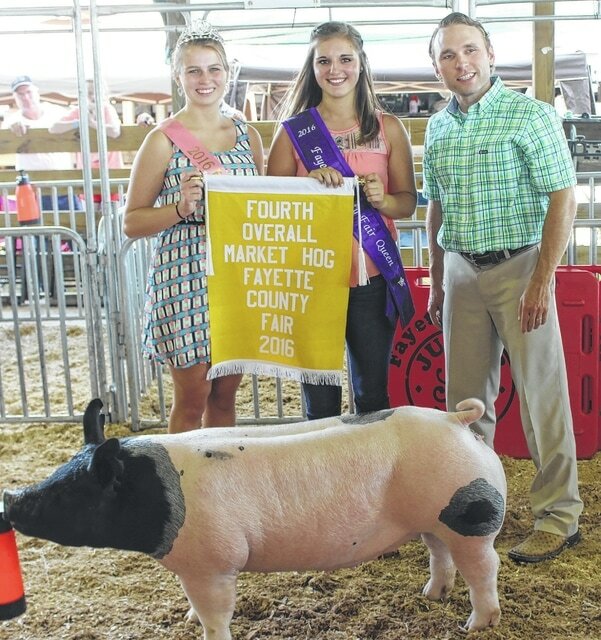 https://www.recordherald.com/wp-content/uploads/sites/27/2016/07/web1_FourthOverallMarketHog.jpgBethany Reiterman (center) won the fourth overall market hog prize Wednesday at the market hog show. Pictured with Bethany are Fayette County Pork Queen Hannah Casto and the judge of the show, Nathan Day. https://www.recordherald.com/wp-content/uploads/sites/27/2016/07/web1_ThirdOverallMarketHog.jpgBrooklyn Baldwin (center) won the third overall market hog prize Wednesday at the market hog show. Pictured with Brooklyn are Fayette County Fair Queen Bethany Reiterman, Fayette County Pork Queen Hannah Casto, and the judge of the show, Nathan Day. https://www.recordherald.com/wp-content/uploads/sites/27/2016/07/web1_ReserveOverallMarketHog.jpgMeri Grace Carson (center) won the reserve champion market hog prize Wednesday at the market hog show. Pictured with Meri Grace are Fayette County Fair Queen Bethany Reiterman, Fayette County Pork Queen Hannah Casto, and the judge of the show, Nathan Day. 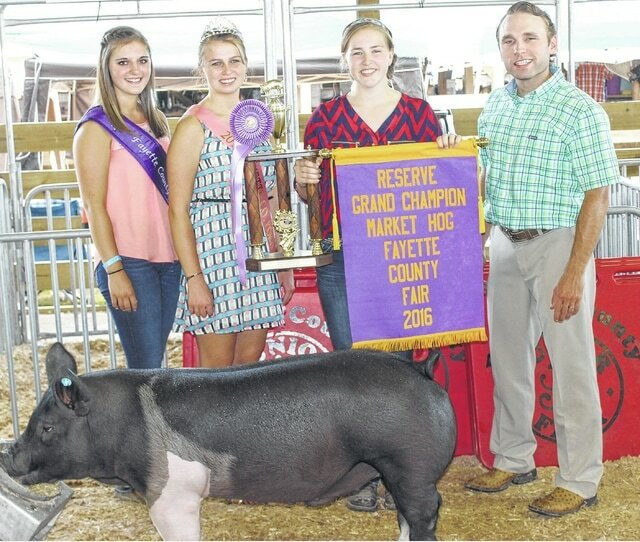 https://www.recordherald.com/wp-content/uploads/sites/27/2016/07/web1_GrandChampionMarketHog.jpgAubrey McCoy (center) won the grand champion market hog prize Wednesday at the Fayette County Fair market hog show. Pictured with Aubrey are Fayette County Fair Queen Bethany Reiterman, Fayette County Pork Queen Hannah Casto, Aubrey’s sister Hillary, the judge of the show, Nathan Day, and Jim Garland.